It's time to share another of the secret sewing projects I was working on earlier this year! 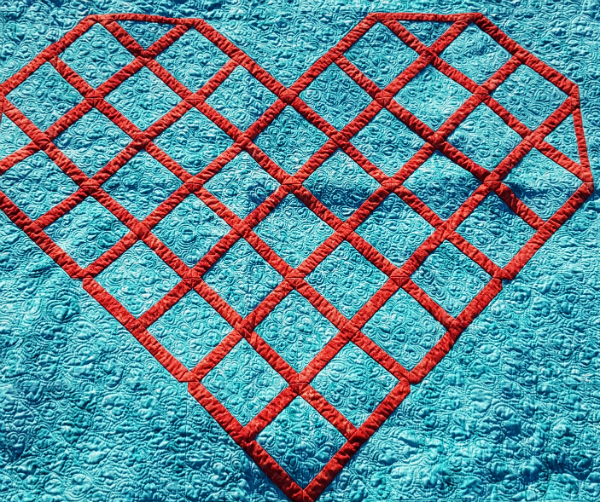 This is Cross Stitch Heart, which is now available in the new issue of Make Modern magazine (affiliate link). 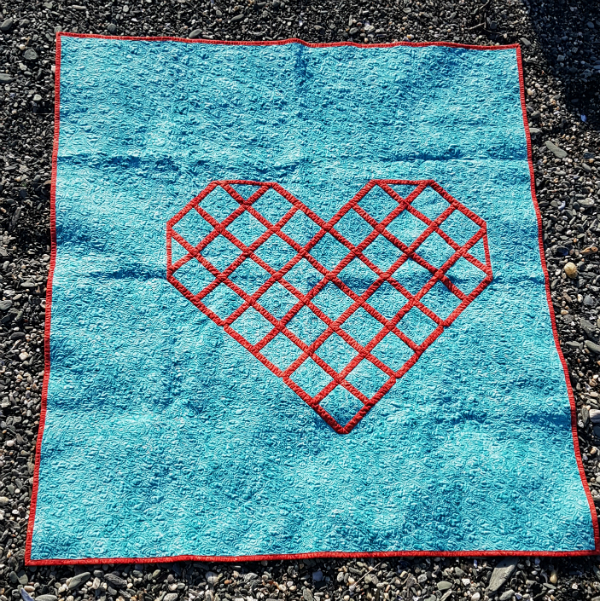 It was fun to design a heart that looks like it was cross stitched. If that sounds familiar, that's probably because I designed this quilt and Cross Stitch during the same 30 Quilt Designs challenge, using the same basic block. The two quilts look nothing alike, though! I used Warm and Natural batting, as usual, and Aurifil 5006 and quilted hundreds and hundreds of echoed hearts all over the background. I bought Aurifil 2270 to quilt the red strips, but when it came time to do it, I decided to leave them unquilted. I like how they pop up from the background. This quilt was a birthday gift for my grandmother as soon as I finished it back in May. I've done a lot of Christmas ornaments for her and one big cross stitch quite a few years ago, but this is the first quilt I've given her. I mailed it without saying a word about it, so it was a big surprise and I came home from a walk one morning to a tearful sounding voicemail from her after she received it 😊 Giving handmade gifts really is the best! 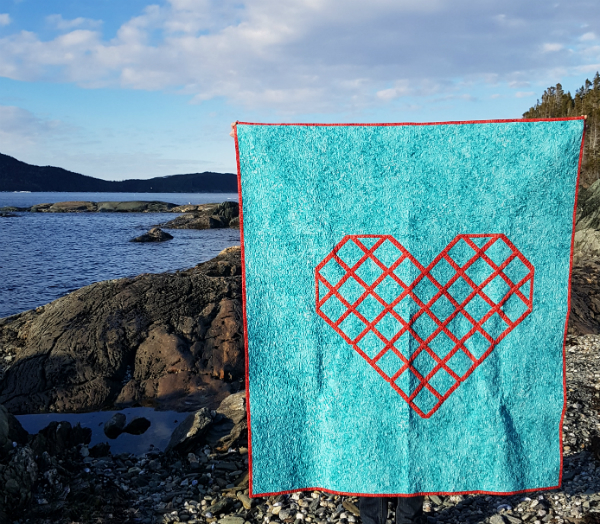 Pick up your copy of Make Modern, issue 23 (affiliate link) to get Cross Stitch Heart along with many other gorgeous designs. Use coupon code 23for6 before July 8th to get it for $6 Australian. Note, this post contains affiliate links, which means that if you click the link and make a purchase I may receive a small commission. This does not affect the price you pay and it helps to support my quilting business. Thank you for your support! Aww, coming home to the voicemail from your grandmother must have been incredibly special. 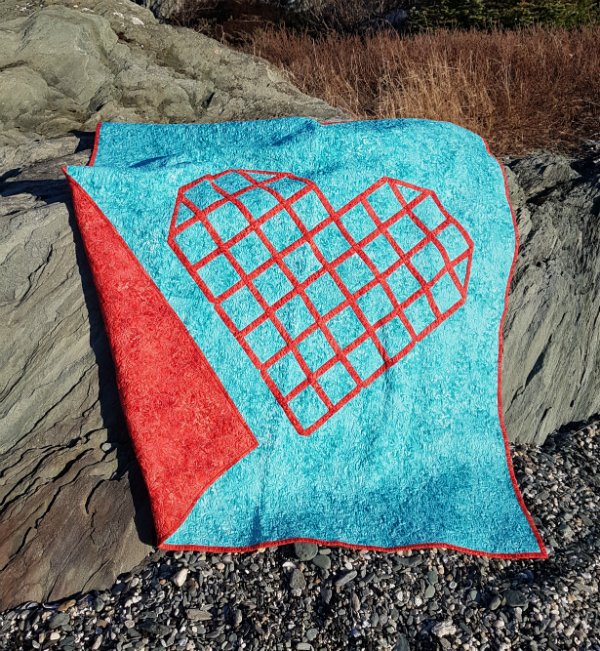 Congratulations on having another published quilt in Make Modern! Congratulations on another great pattern. Happy vacation! The voicemail from your grandmother is so worth it. I love this quilt - so beautiful. She is very lucky, and we are lucky for your sharing it with us.